Superb and spacious brick village property, located in a peaceful location 2mn driving from Fruges, 50mn from Calais. In good general condition, it is built on 3 levels with a full basement, and the 1st floor can be converted into 6 further bedrooms. the groundfloor has: 3 bedrooms, living room, dining room, fitted kitchen, bathroom, toilet, garage. Oil and electric central heating, mains sewage, balcony. Set on 1300sqm of land. Good value. Charming property in a lovely and quiet village near Saint Pol, set on a superb planted garden of 5640 m², it includes: large living/dining room with log fireplace and Frech windows, fitted kitchen, back kitchen, wc, 1 bedroom on ground floor with bathroom, upstairs: 3 nice bedrooms (24 m² each one), shower room, wc. 3 car garage, terrace, tennis court, 3 cellars, loft. Beautiful large farmhouse with large detached brick barn and stables situated in a small village few minutes from Hesdin. Large courtyard , garden to the front, planted gardens and field to the rear. oil central heating and double glazed windows. Superb detached property in perfect condition, set in a wonderful secluded garden with a stream and two attractive barns, located in a quiet area of the Canche Valley, 5mn walking from shops, train station and schools. It comprises a large lounge/dining room with open fire place, French windows leading on to an extensive patio area. Modern fitted kitchen and utility room. 4 double bedrooms,1 bathroom, 1 shower room, 2 WC. It is built on around 1 acre of land. Gas central heating, mains drainage. This is a beautiful property, being offered for sale at a very realistic price. Super house with lots of character situated near Montreuil-sur-mer. Built on 900 m² of planted land, this former school offers altogether 300 m² of living space made up of : 3 bedrooms, bathroom, wc,living room with traditionnal fireplace, dinig room, fitted kitchen, exposed beams, original tiling, cellar, wine cellar, garage, outbuildings. Upstairs : mezzanine floor, 1 bedroom, possibility of a bathroom. Nice view on the country side, near Portbail, and opposite Jersey, modern house in very good conditions with garden of ½ acre. corridor with lot of cupboards, bedroom of 11 m², bathroom, separate WC. Située en campagne, vaste maison, offrant de belles prestations d\'ensemble. RDC : Pièce à vivre de 48m² incluant un espace cuisine aménagée et équipée, coin repas et salon. 4 chambres d\'environ 10m² chacunes, salle d\'eau comprenant une douche, 2 vasques sur meuble et un WC (sèche-serviette). This new house / villa of 140 m² (about 1505 ft²), with a land size of 2500 m² (about 0,62 acres) has 10 rooms including 4 bedrooms, 1 bathroom and 2 toilets. It has dining room and a garage. Totally renovated Heating : underfloor. Very nice and peaceful setting for this spacious old farm-style property with large closed courtyard and outbuildings, set on 2 acres of land, 5 mn from Fruges, 50mn from Calais. Its 320sqm living space comprises of on the groundfloor: large living/dining room with open fireplace leading to large fitted kitchen, bathroom, wc, cellar. Upstairs: 5 bedrooms, shower room, wc. Double garage. Oil central heating downstairs, electric radiators upstairs, double glazing windows, septic tank. Can be sold furnished. Lots of character, early viewing recommended! Spacious modern house with 5 bedrooms,situated close to the beach. Short Drive to Beach. La Haye du Puits area. Situated just 3 kms drive to the sea side. House with character with privativ garden of 2490 m². Outbuilding. laundry of 15 m², green house. 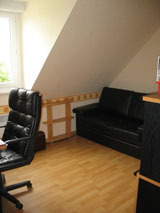 bedroom of 15 m² and rooms of 35 m² and 25 m² used for storage. Stone built outbuilding. Oil central heating, septic tank. Large stone built property with numerous outbuidlings, situated 3 kms to the beach and the marina and just 1 km to the shops. Fenced garden of 2617 m². 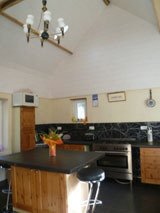 Living room of 25 m² with wood burning stove, large fitted kitchen. On 1st floor : Landing, 4 chambres of 9 m², 9m², 12 m² and 12 m², large attic of 25 m². 3 garages with electric doors. Nice garden and beautiful view over the valley. This house / villa (property) , with a land size of 2269 m² (about 0,56 acres) has 9 rooms, 1 bathroom and 1 toilet. It has a living room, a balcony, a terrace and 2 garages. Others : fireplace.